U Thila Wunta, the teacher of Namgyal Rinpoche, came from the Mon State of Burma. He was born 28 June 1912. He began his training at a monastery school in 1919. At the age of 15 he took the vows of a monk. In May 1932 he received full ordination as a Bhikshu in the Theravada Order under the direction of Kyaw Sayadaw.1 He spent his first three month retreat at Htan-bin Monastery near Wekalaung Village. Between the years 1933 and 1938 he practiced meditation under the supervision of Sayadaw U Narada of Payagyi Monastery, Sayadaw U Ariya of Ahlei Taik Monastery, and Sayadaw U Pyin Nyein Da of Aung Mye Bonzan Monastery. These three Sayadaws were all renowned scholars and meditators. U Thila Wunta settled for some time near the great Shve Dagon Pagoda, in Rangoon. It is generally believed by Buddhists that certain holy sites or "power spots" are especially conducive for progress in meditation. Experience has shown that meditation is not only easier, but that insight dawns much faster, when practice is carried out at such places. Further, because many beings over the centuries have themselves realized Enlightenment at these special holy sites, it is felt that a residue vibration of their presences remains there. The Shve Dagon Pagoda at Rangoon is one of the world's most special power places. In 1941 the war forced U Thila Wunta to leave Rangoon for his native Mon State, where he remained until the end of hostilities. In early 1946 he returned to Rangoon, where he took up residence in a grass hut again not far from the great Shve Dagon Pagoda. In May of 1947 he was given another small meditation hut by some devout lay-people living in Kapili Kwathi on the west side of the Shve Dagon. There he spent the rainy reason practicing meditation with eight fellow monks. At the end of 1947 he set out for Mandalay so as to pursue further meditation practice at Mahatmya-muni Pagoda, which is a famous holy site in Mandalay. While struggling with his meditation at Mahatma-muni Pagoda, U Thila Wunta met a disciple of Bodaw Aung Min Gaung. The latter had a reputation as a fully realized Burmese saint. Bodaw Aung Min Gaung was a master who not only knew how to teach meditation but one who had himself acquired full realization. He was a truly liberated being. Inspired by what he heard about Bodaw Aung Min Gaung, U Thila Wunta traveled to Popa to meet the master in person. This meeting brought about a radical change in his understanding. To fully focus on his practice, he went into solitary retreat in the forest, wandering from village to village for food but otherwise living entirely alone. Upon U Thila Wunta's eventual return to Rangoon, a pious layman named U Pho Nweh donated five acres of land in the hope that U Thila Wunta would restore an ancient, broken stupa (pagoda) on the property. Initially U Thila Wunta thought that this would distract him from his meditation practice, but his guru Bodaw Aung Ming Gaung advised him to go ahead and accept the gift. U Pho Nweh, his brothers, sisters, and entire extended family, supported the restoration of the old pagoda, both with money and with labour. The work began on 13 January 1949. That was the start of a project that has continued throughout U Thila Wunta's entire life up to the present. Today, surrounding the reconstructed central pagoda, there are now some 174 smaller pagodas. Buildings for monks and lay meditators have also sprung up throughout the grounds. The original five acres has been transformed over the years into a thriving monastic complex, known as Dat Pon Zon Aung Min Gaung Monastery, firmly centered in the Weizzer meditation tradition. In 1952 U Tilla Wunta went on pilgrimage to Bodh Gaya and other holy sites of Buddhism. In Sri Lanka he visited the great monastery of Anuradhapura. At Mihintali he meditated on the same ground where Mahendra (Mahinda), the princely son of Emperor Asoka, attained enlightenment. He went to Rajgriha, the 'Vulture's Peak, where legend says that Buddha Sakyamuni taught the Prajnaparamita-sutra, the practice of Transcendental Wisdom. From Rajgriha he went to Sarnath, the site where the Buddha spoke his very first teaching on the four Truths and the eightfold Spiritual Path. After that pilgrimage, U Thila Wunta returned to Rangoon and spent the next five years in meditation at the base of a tree on the grounds of Dat Pon Zon Monastery. After U Thila Wunta attained awakening, he began a number of extensive trips around the world. 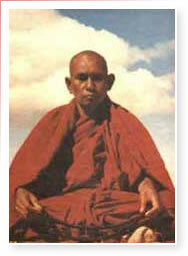 Starting in 1955 the venerable Sayadaw visited Thailand, Nepal, and India. In India he went to Lumbini, Sarnath, Jammu, Sravasti, Kusinara, Darjeeling, and again Bodh Gaya, the holiest site of all. At Bodh Gaya he performed an intensive 49 day meditation retreat. He then returned via Thailand to his native land. In the meantime his little monastery had grown to accommodate twenty monks. The Sayadaw U Thila Wunta has dedicated his life to teaching the profound method of meditation that he learned under the compassionate guidance of Bodaw Aung Min Gaung. He has trained an exemplary group of men in the discipline of a Buddhist monk, and he has encouraged many Buddhist lay men and women to take up the practice of meditation. His fame in Burma, where he is looked upon as a living Arhat, an enlightened Master, is very great indeed. Many miracles are attributed to him. The impersonal goodness, compassion and wisdom that seem to radiate from his presence are tangible. Everyone who has had the blessed fortune to meet U Thila Wunta has felt that they were in the exceptional presence of an extraordinary human saint. Namgyal Rinpoche's teacher U Thila Wunta was an austere, old man of great presence and power. The depth of his wisdom was written all over his aged face, and the intensity of his love was like a tangible force. 1 The title Sayadaw (Skt: Upadhyaya, Tib: Khenpo) means "preceptor" or "abbot". When one goes for ordination in the Buddhist tradition, of the five or more monks necessary for an ordination service, the two of most importance for the applicant is one's Preceptor, or Upadhyaya, and one's Teacher (Acharn or Acarya). 2 It is thanks to Mr. L. Olmstead, a long time student of U Tilla Wunta, that we have been able to correct some of the earlier statements that we made in the biographical sketch of this great man. Mr. Olmstead kindly pointed out, "You mentioned Sayadaw's teacher, Bodaw Aung Min Guang (aka Bo Minguang) being a practitioner of the forest tradition of Phra Acharn Mun. This is incorrect." The term "weizzer" derives from the Pali word "vijja" meaning wisdom or awareness, according to L. Olmstead. 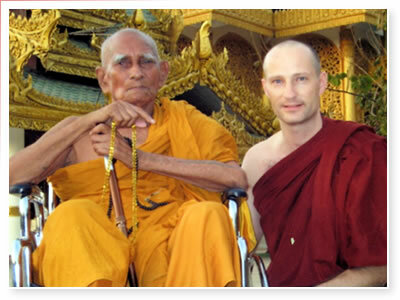 It was the weizzer tradition that Bodaw Aung Min Guang passed on to the venerable Sayadaw U Thilawunta. We are pleased to now correct an error in our original text.